I led a Wind, Brass and Percussion sectional rehearsal at the Junior Guildhall on Saturday 14th of October 2017. The sectional rehearsal focused on Mendelssohn’s Violin Concerto in E Minor (Op.64) and De Falla’s Three Cornered Hat (Ballet). I began the sectional with tutti forces, and asked the students about Mendelssohn and the history of the Violin Concerto in E Minor. I asked the trombones to play the Chorale, Wie wunderbarlich ist doch diese Strafe! No. 46 from Bach’s Matthew Passion (BWV 244) and asked them why Bach was relevant in a rehearsal focusing on Mendelssohn and de Falla. I explained that Mendelssohn (aged 20) put on a performance of the Matthew Passion in Berlin, after inheriting the manuscript from his grandmother. Mendelssohn’s performance sparked a new interest in the music of J. S. Bach, who’s music had rarely been performed outside of Leipzig since his death. I went on to explain that Mendelssohn’s Violin Concerto had been written for the soloist Ferdinand David. At that point, I saw awed faces in the trombone section, who all (very obviously) knew about Ferdinand David’s Trombone Concertino (Op.4). 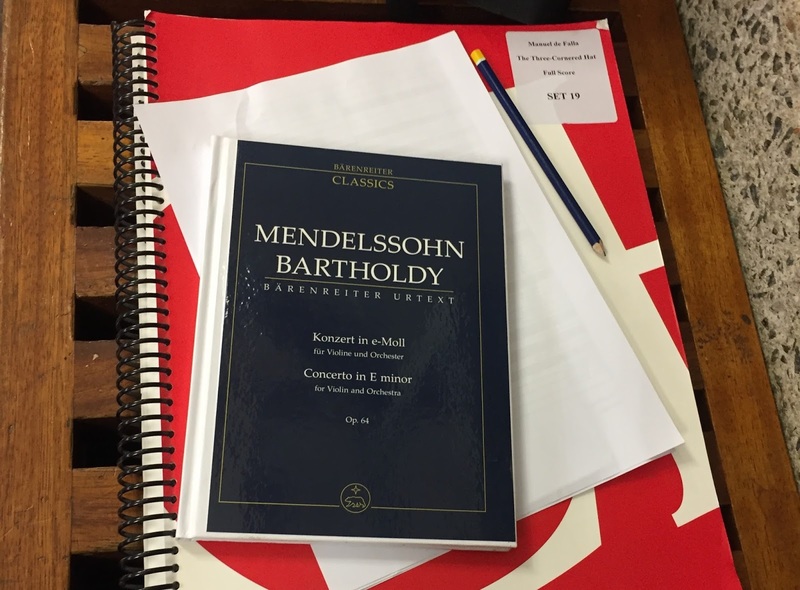 I was impressed with the students who attended the sectional and I was able to impart a few Historically-Informed ideas for the Mendelssohn and other general points on section playing, tuning and intonation. After a short break, the second half of the rehearsal saw the full Wind, Brass and Percussion sections (including the Celeste and Piano) and we began playing the Three Cornered Hat by Manuel de Falla - an incredible piece of music. Again, we began with some brief biographical information about the composer and the piece: mentioning the premiere in London (1919) and the fact that the ballet stage and costumes were designed by Pablo Picasso. We worked on various sections of the piece, particularly the final movement, and made the rhythms as dance-like as possible, particularly in the alternating triple and duple bars. It was great to hear what the students of the Junior Guildhall are doing, and I left feeling optimistic after an enjoyable rehearsal.